All of our stallions are started under saddle prior to beginning their breeding career. Both Skip Will Win and Whammy Ball have been ridden regularly on trail and with working cattle. They are exceptional rides with a sure-footed feel and smooth transitions. Call Me Nifty Tu has been trained in dressage and is a very nice ride as well. We lost a very beautiful horse on December 9th 2008. 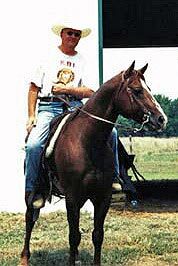 Mr Bright Eyes was the horse I loved to show, whether it was at an AQHA show in Wichita, Kansas, Ozark Quarter Horse shows or at our local State Line Horse Shows. We showed him as a yearling and two year old and he would allow me to primp and work his coat into a beautiful shine. Clippers, scissors, banding, blankets, if it had anything to do with attention, he welcomed it. Many a time he was mistaken for a gelding while waiting to show because he just had a great temperment. MBE was special and is greatly missed. Thank you "Eyes" for being a part of our life. Starring Cool "Mr. Bright Eyes", was an own grandson of Obvious Conclusion and Ima Cool Skip. His Sire was Starring Obvious by Obvious Conclusion and his Dam was Sassy and Cool by Ima Cool Skip. His Sire was 2000 Open Halter ROM, 5th Place at the World Show in 2 Yr old Stallions, Amateur World Champion in 2 Yr old Stallions, and in 2001 was the Amateur Reserve World Champion in 3 Yr old Stallions, 6th Place in Open at the World Show in 3 Yr old Stallions, and received an Amateur Halter ROM. Click here to view printable pedigree in new window. 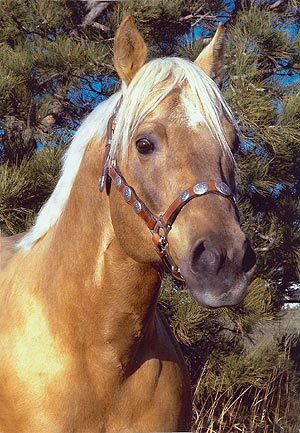 Dukes Golden Legacy "Duke", is a 1997 15.1 hand palomino stallion by "Skip Will Win" and out of "Ms Rapid D Or", who is a 1981 palomino mare out of Halter point earner Rapid D Or by Rapid Bar who had a speed index of a 100 and points in Halter. Rapid Bar was a 1958 son of Three Bars and out of Miss Chicaro, by Chicaro Bill. 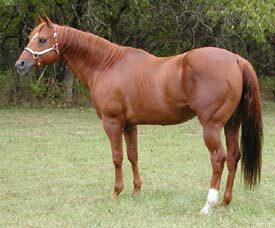 Rapid Bar was AAAT and a 1965 AQHA Champion in Halter. Rapid D Or's Dam, Robin D Or, a 1962 palomino, also had point earners and race winners in her pedigree. Bras D Or, a 1940 dun stallion was raced and had points in halter. Osage Red, a 1945 sorrel stallion had a speed index of 95. 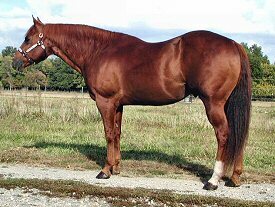 Ms Rapid D Or's Dam, Sokota Sparky, a 1972 sorrel, had points in Halter and a number of Halter and Performance horses on her Sire's side. Sokota Sparky's Dam's sire and grandsire were both winners at the race track and as halter and performance point earners. Winning Note, a 1960 sorrel stallion, accumulated points in Halter and Performance. His Sire and Dam were both race track winners. Clabbers Win, a 1954 chestnut stallion had a speed index of a 100 with 42 starts, 14 wins, 5 seconds, 9 thirds, and $44,743 in earnings. Gold Note, a 1952 chestnut mare, had a speed index of 95 with 31 starts, 8 wins, 5 seconds, 3 thirds and $7,531 in earnings. 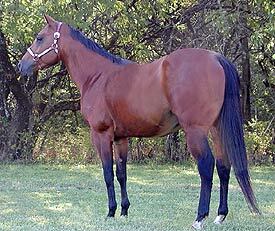 Ms Rapid D Or's sire, Sokota Babe, a 1962 sorrel stallion, accumulated points in Halter and performance. Sokota Babe was by Babe Cody by Bill Cody. 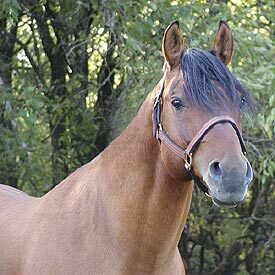 Babe Cody accumulated points in Halter and Performance while also being known for siring 11 AQHA Champions, 9 Superior Halter and performance horses, and the earners of 20 ROMs and 1440 AQHA points. Bill Cody, a 1944 sorrel stallion and one of AQHA's first well-known halter horses, was out of Wimpy P-1 and Pesetita, a mare out of the Old Sorrel. Bill Cody earned 18 Grand Championships, 97 Halter points ( Superior in Halter) and was the 1952 high-point halter horse. Duke's sire, "Skip Will Win" is out of "Fly by Night who is by the great "Blondy's Dude." 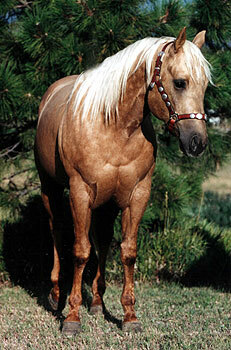 Blondy's Dude was the 1962 Grand Champion Stallion at Fort Worth Stock Show. He has 1,402 registered foals who accumulated 2 World Champions, 1 Supreme Champion and 30 AQHA Champions. They earned 3,032 halter points and 7,074 performance points. Duke is a full brother to our mare Skips Star D Or and came to us in October 2007 from JD and Holly Bakke of Parker, Colorado . Skip was a horse that lived a very full life. Everyone commented how striking he was with his strong jaw and bright eyes. He had a presence at the barn and it is definitely missed. We have several mares out of him and riding horses that will always keep his memory alive. When we hear the thunder roll....we know it is Skip galloping through the sky. Skip Will Win "Skip" is a 15 hand rich sorrel, almost chestnut, stallion that produces exceptional cow horses that like to go. He is line-bred Skipper W on his sire's side and Blondy's Dude, Parker's Trouble and Sugar Bars on his dam's side. All of his foals carry Blondy's Dude on their AQHA papers. Skip is a 5 times bred Skipper W stallion. His Sire, Skippa Little, was a 1977 Palomino bred by Hank Wiescamp and his Dam was Fly By Night, a 1969 Sorrel Mare out of Blondy's Dude. 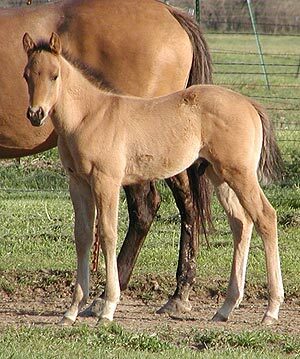 Skippa Little sired 81 foals of which 9 were Performers. Performance of his foals earned: 7 Performance Wins, 13 Performance points, 36 Halter Wins, 24.5 Halter points, 5 Grand Championships, 6 Reserve Grand Championships, and 1 Reserve All Around Championship. Skip is a great-grandson of Skippa String, AAA stakes winner by Rukin String, 1953 World Champion Quarter Running Stallion and Racing ROM, by Piggin String and Queenie, World Champion Quarter Running Mare in 1944-45 and 1945-46. Whammy Ball "Whammy" is a grandson of Three Bars on his Sire side and his Dam was Racquet Ball out of Mr Capital Gain, sire of several cutting horse winners, including Budget Bar Leona and Gold Seeking Bonnie (Dam: Bonnies Bug by Tyrees Fancy Dude). 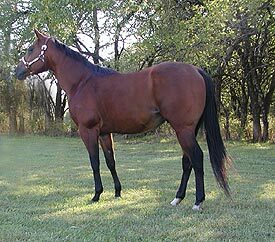 Skip's Aid was Racquet Ball's Dam and was a 1959 Bay Mare bred by the Wiescamp estate out of Skipper W. Skip's Aid produced 13 foals with 5 performance foals with 28 Halter points, 45 Performance points, 3 Performance ROMs and 1 AQHA Champion. Whammy's Sire, Whammy Cat, had a speed index of 95 with 6 wins, 3 seconds and 2 thirds out of 22 starts. Total earnings at the racetrack equaled $2,631. Whammy Cat's achievements were setting a new track record and a 1964 Racing ROM. Whammy Cat had 55 performing offspring with 13 racing winners, 3 stakes placers, money earned equaling $37,904, and 15 Racing ROMs. His foals have accumulated 392 Open Halter points, 33 Youth Halter points, 290.5 Open Performance points, 26 Amateur Performance points, and 113 Youth Performance points, 10 Performance ROMs, 2 AQHA Champions, 1 Superior in Halter, 1 Superior Performance, 1 Superior Performance Earner, 3 Show All-Around Wins, and 3 Show All-Around Winners. Performance Winning offspring were Open High Point in Reining, Open High Point in Western Riding, Open Superior Western Pleasure, and National Cutting Horse Association Winnings. Call Me Nifty Tu "Call" is a 1994 14.3hh dun son of Nifty Horatio, an own son of Horatio who was an own son of Sugar Bars. 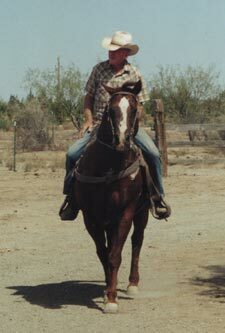 My father sold Nifty Horatio and an own son, Call Me Nifty Tu in the 1990s to JD and Holly Bakke at the Legacy Ranch in Parker, Colorado who continued to breed Nifty and Call. In September of 2005, the Bakke's contacted us about bringing Call back home. I know Dad is looking down right now and thrilled to see Call become a part of our family again. Call was started as a 3 year old by a cutting horse trainer showing a lot of potential. He has spent most of his adult life as a "ride around the ranch" horse but has also had the opportunity to engage in jumping and dressage. 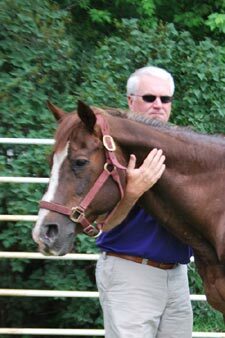 When Call was 4, a friend of Holly's daughter needed a horse for a month because her TB was lame. She borrowed Call and he did a brief time learning to jump. According to Holly, he wasn't too sure about that jumping stuff. :) He kept going up to the jump and trying to eat the fake flowers:) Then a couple years ago, a close friend of Holly's, Ann, had her appendix gelding die and she wanted something to ride so she started riding Call in dressage. The dressage suited Call because it kept his mind busy. According to Holly, Call is one of the smartest horses she's ever been around. Learning all the dressage movements kept him thinking about the rider and their expectations. He's very good at the shoulder in, half pass, side pass, etc. and has learned flying lead changes. Call enjoys people and always come when you call him. He loves attention and also loves work. He insists on being the first horse that you ride! Call's foals all seem to have his "work ethic." They don't seem to care what discipline you train them for, as long as they have a job and get lots of interaction with people. They also have his athletic ability. 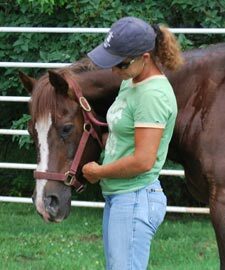 Holly has commented that she has always thought Call would have been very good at cutting or reining, but just didn't have the knowledge to train him for it or the resources to have him trained. 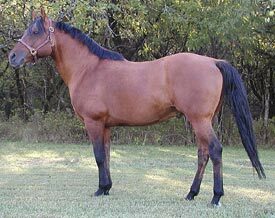 Call's grand dam, Nifty Rickels, was a halter point winner and dam of 12 foals with one as a performer, Heather Light an 1964 dun mare by Leo Lightning. Foals out of this mare were performers in racing (Sugarton, a 1977 dun gelding by Louton Jet), performance winner and National Cutting Horse Association winner (Right Sugar Dandee, a 1978 dun stallion by Ima Dandee Bar $5,388.66), performance winner, halter winner, novice winner (HF Lady Ration, a 1996 dun mare by Clarks Hill Billie). 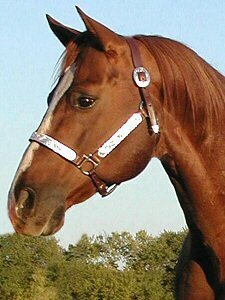 Nifty Rickel's sire was Rickel's Cody, the grandsire of 272 foals of which 34 were performers collectively earning 193 Performance wins, 274 Performance Points, 49 Halter wins, 33.0 Halter Points, 4 Performance ROMs, 3 World Championships, 1 Performance Superior Award, 1 Reserve World Championship, 8 Grand Championships, 14 reserve World Championships, 9 All Around Championships. Other earnings: AQHA World Championship Show $7,715.98, National Cutting Horse Assoc. $1,284.83, National Reining Horse Assoc. $4,951.36, 108 Palomino Horse Breeders Halter Points, and 89 Palomino Horse Breeders Performance Points. Whammy Ball foals are always interested in attention from us from the very beginning. They are just people friendly colts that love to be touched. This colt is no different! Gold was a tremendous weanling and haltered and started leading quickly. 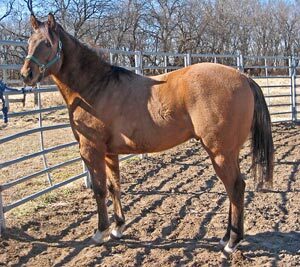 He has been in reining training since May 2009 and looks to also be a roping prospect as well. We expect to show him in 2010 at Buckskin shows and a few AQHA shows.